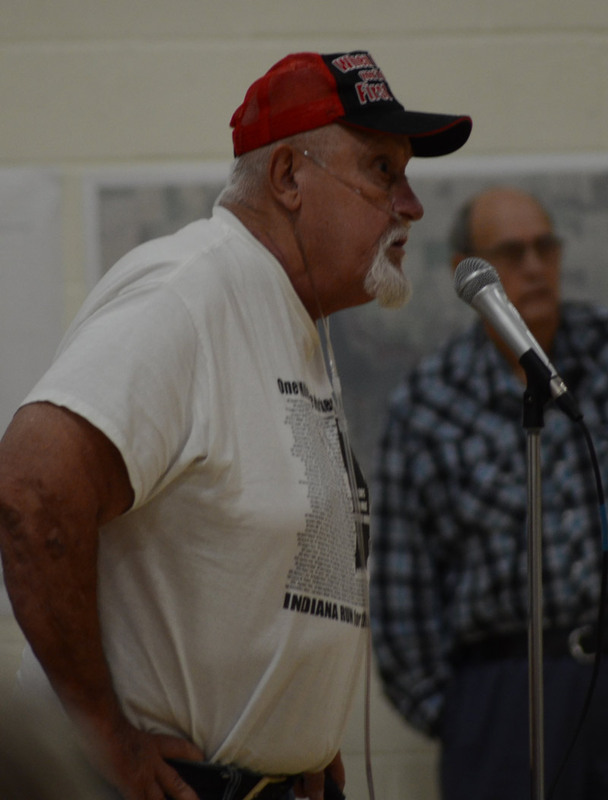 NORTH WEBSTER — Statements for and against sewers and questions were heard from residents in and around Tippecanoe and Chapman lakes Saturday afternoon. 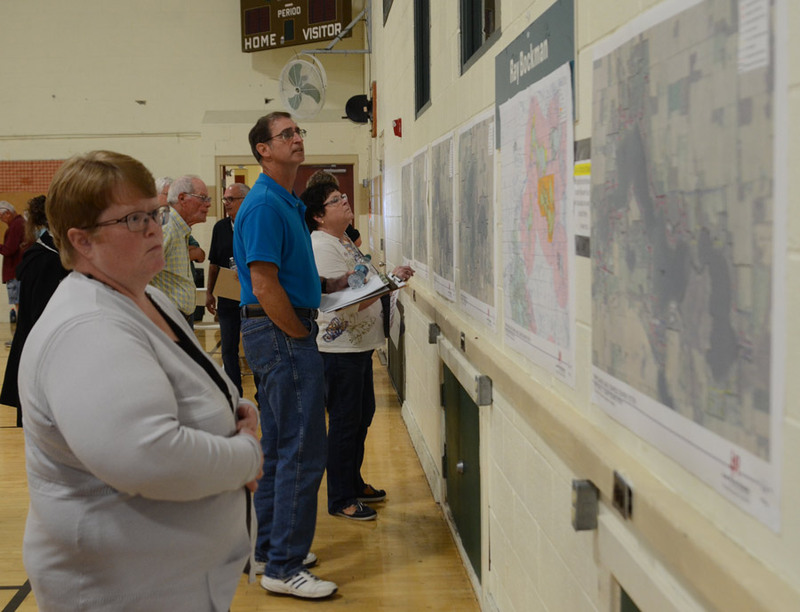 A public meeting was held by the county commissioners and council to provide information about the proposed Tippy-Chapman Lake Regional Sewer District, and hear from the public. 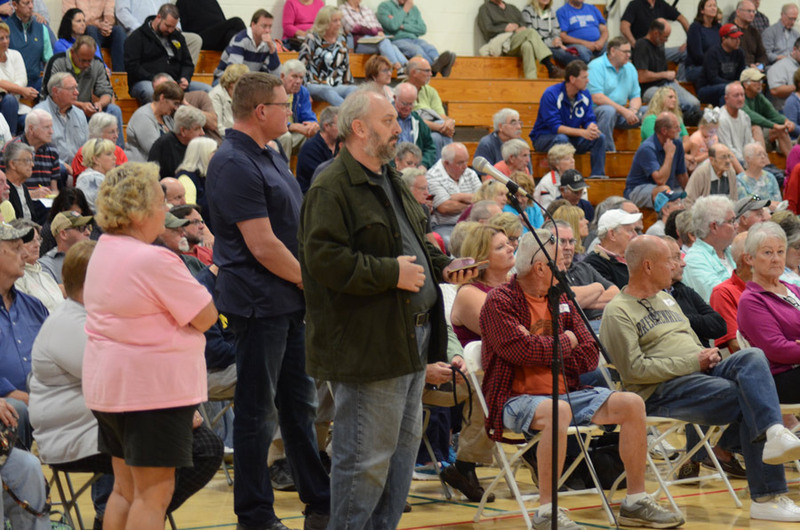 Approximately 350-400 people gathered in the gymnasium of the North Webster Community Center. While over 50 individuals signed up to speak, only 25 stood before the microphone. 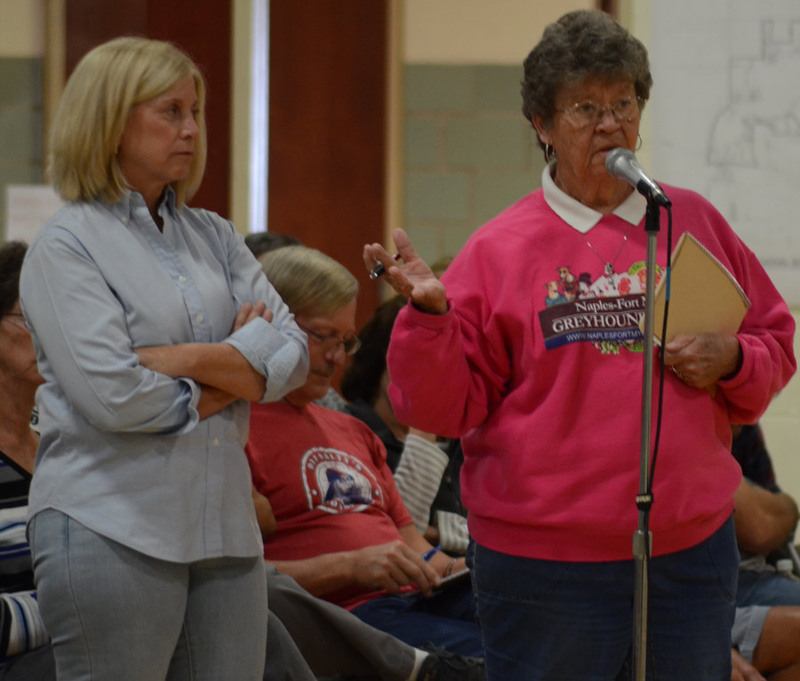 A majority of the statements were in favor of the sewers and a few stating they were against. It was noted during the hearing the initial request to form a conservancy district was on hold and could be reactivated in the courts should the regional sewer district fail. Questions ranged if particular areas will be included in the future, did a resident have to hook up to the system, why current septic systems had to be destroyed, request for clarification of the financial aspect, why areas were included and others not, if there was a way to stop the petition, and how the sewer system will affect the watershed. Lift stations, grinder pumps and the reasons behind the regulated set backs were also included in the questions. Visente Garza stated “There is no secret I’m against the project.” He asked about accountability of those working on the project. “The water is still here, it’s still clear … your making statements when the truth is (the rate) schedule is after the fact. Do you have insurance?” His question wasn’t clear to the consultants, with Garza alluding to a potential lawsuit if adding information was false. Prior to opening the meeting to questions, Ken Jones, president and CEO of Jones Petrie Rafinski, design engineering company for the project, provided a history of how the project came into being, what the petition includes, process of a regional district formation, status of the current effort, why a sewer district should be considered, project areas, community and study area concerns and facts, health, sanitation and human welfare, past studies dating back to 1970. He also responded to common questions and concerns heard, provided a summary of the project, and offered various website links on topics including financial assistance. Jones noted the timeline for the project. “Our best hope is for 36 months out,” he stated for when the project would be completed. The goal is to have construction begin in the third quarter of 2019 with connection to the system beginning in mid-2020 and all users connected by the end of 2021. During Jones’ presentation he stated all residents within the boundaries of the sewer district would be required to hook onto the sewer. However, he noted those with septic systems in good working order and under a specific age, could file an exemption with the regional sewer board. It was also noted those outside the regional sewer district, but have the sewer line near their property would not be required to tap on, but have to request to tap on. It was stressed several times during the meeting the financial portions of the project were estimates until numerous other factors were established, including financing of the construction. “We are whittling it down to be the most cost effective,” said Jones. Additionally it was noted while there will be no vote by those in the proposed district, there will be additional opportunities to voice concerns at a public hearing held by the Indiana Department of Environmental Management, and a petition against the formation of a sewer district could be filed. Also participating in the public hearing were consultants Jeff Rowe with Umbaugh and Associations, financial and rate advisors and Pattie Zelmer, attorney with Ice Miller, handling the legal aspects. Chad Miner, city attorney, presided over the hearing. Miner stressed at the start of the meeting the commissioners and council would not be taking a vote that day. Those present had the opportunity to view proposals on five different options – gravity system, low pressure sewer system, regionalized with the Lakeland Regional Sewer District Waste Water Treatment Plant, building a new Wastewater Treatment Plant, and regionalization with the city of Warsaw. Alice Quinn, Indiana State Department of Health, and Kevin Edmonds, Chapman Lake resident, take a look at the project options. 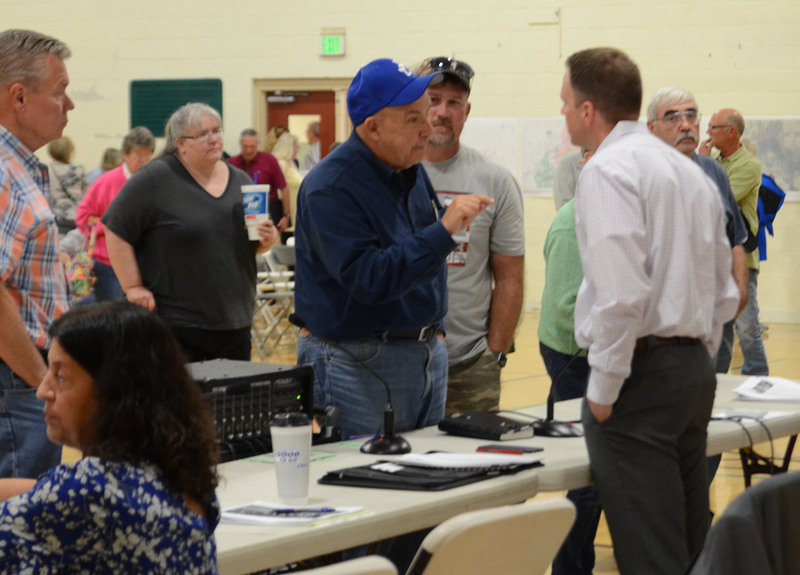 The bleachers and chairs were full of residents of Tippecanoe and Chapman Lake areas who attended the public meeting on the proposed regional sewer district. These residents, including Jon Tyler and Robert Payton, await their turn to speak. John Durham is the first to take the microphone. Man met individually with the consultants after the hearing to ask questions.